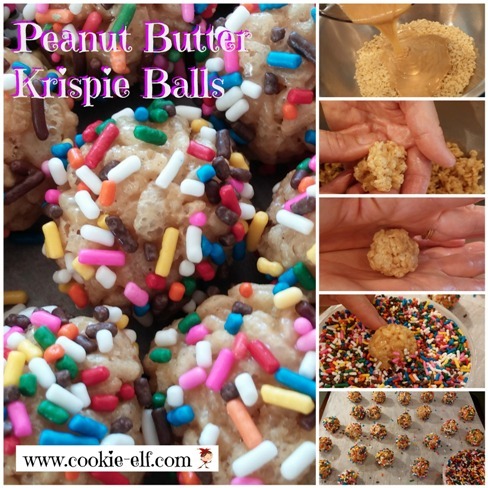 Peanut Butter Krispie Balls are a variation of Rice Krispie Treats, the classic no-bake cookies. The originals are made with crisp rice cereal, marshmallows, and melted butter. This version includes peanut butter. It also differs slightly in its formation – this recipe is for a molded cookie rather than a bar cookie. The mixture is shaped into balls and rolled in colored sprinkles. It is an easy cookie recipe is perfect for kids to make. As an added bonus, the cookies are gluten-free! Pour sprinkles into a small bowl. Set aside. Set butter, marshmallows, and peanut butter in a large, microwave-safe bowl. Microwave on high for 30 seconds. Remove the bowl from the oven and stir. Return bowl to the oven. Repeat. Stir the marshmallow mixture until it is smooth. Pour marshmallow mixture into rice cereal. Mix thoroughly to coat cereal. Allow mixture to sit for 5-10 minutes until it is cool to the touch so you can handle it. With wet fingers, shape cookie mixture into 1-inch balls, squeezing together each one firmly. Roll formed balls in between your hands until the surfaces are smooth. Transfer each cookie to the bowl filled with sprinkles. Coat each cookie with sprinkles and set it on lined cookie tray. Allow cookies to set until completely cool, about 30 minutes. You can substitute 5-6 ounces of regular marshmallows for miniature marshmallows. For best results, use fresh marshmallows.